If you and dairy don't mix well, don't have a cow. You can still meet your calcium needs by choosing some of these excellent dairy-free sources! There should be little debate about calcium's role in building strong bones; roughly 99 percent of the body's calcium stores are found in your bones. But calcium is so much more than a one-hit wonder. You also call upon this mineral to aid muscular contractions, secretion of hormones, and optimal nervous system function. There is even some evidence that calcium may play a role in fat loss. If adequate calcium is not consumed in the diet, the mineral might be leeched from bones to help meet other needs in the body. Over time, bones can become weaker as a result. And nothing can put a dent in a fitness program quite like a stress fracture. The recommended dietary allowance (RDA) for calcium is 1,000 milligrams a day for women up to age 50 and men up to age 70. This level is easier to achieve if a few daily servings of dairy are part of your diet. But not everyone can—or wants to—consume enough dairy to meet daily calcium needs. Which begs the question: Does eating too little dairy guarantee you'll come up short in the calcium department? Not necessarily! There are several cow-free sources of calcium that can help you nail your daily quota. Eat any of these dairy-free foods regularly to help maintain bones of steel! Low in calories and a good source of complete, plant-based protein, tofu has a place in anyone's diet, especially for people in need of a calcium boost. A mere 3-ounce serving provides almost half of the daily requirement for calcium! But there is a catch. The key is to purchase tofu prepared with calcium sulfate as a coagulant, which is sometimes referred to as "calcium-set." Be sure to read labels carefully to make sure you are getting the calcium you want and need. Some brands use magnesium chloride as a coagulant, and these don't have nearly the same amount of calcium. Need to know: Tofu comes in a variety of textures. Extra-firm and firm tofu are the best types to be used for cooking methods such as stir-frying and grilling. Soft tofu isn't sturdy enough for these preparations, but it can be worked into smoothies, dessert puddings, and soups. 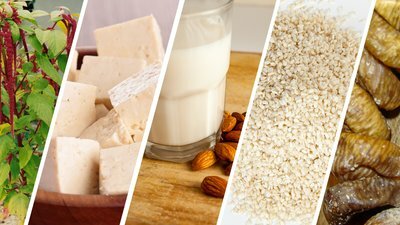 These days, most cow's-milk alternatives like almond, soy, or cashew are fortified with calcium. Each one-cup serving of almond milk may supply up to 45 percent of the daily need for this vital mineral. You'll also likely get a dose of vitamin D for extra bone support and enhanced calcium absorption. Be careful when selecting your brand of milk, however, as a serving of sweetened almond milk can derive half of its calories from added sugar (12-20 grams percup). Look for those labeled "unsweetened" to avoid drinking unnecessary calories. Need to know: There's always a chance that the calcium carbonate and other forms of the mineral added to nondairy milks could separate out from the liquid. Before using, give the carton a good shake. Amaranth is a gluten-free grain in a similar vein to quinoa. But what you should be after is its tender greens, which are highly nutritious. Among greens, amaranth leads the way in calcium levels—roughly 12 percent of daily needs in a 2-cup serving. Other nutritional highlights include plenty of vitamins C and A, as well as a huge dose of vitamin K.
Chain supermarkets don't always carry this peppery green (cooking it mellows the flavor), but many Asian grocers stock the purple-streaked leaves. Anywhere other greens go, so, too, can amaranth. Use it interchangeably with items like spinach in salads, stir-fries, and soups. Need to know: Other greens that deliver significant calcium include collards, mustard greens, turnip, kale, bok choy, and broccoli. It's worth mentioning, however, that spinach and beet greens in particular are high in oxalates, which limit calcium absorption. To reduce oxalate levels, consider steaming these two when preparing. Dried figs are a surprisingly good source of bone-friendly calcium—about a quarter of your daily needs can be found in one cup. But their impressive nutrition resume doesn't stop there. Figs also supply vitamin K, potassium, iron, magnesium, and dietary fiber. Sliced, dried figs are a tasty addition to oatmeal, yogurt, salads, cooked grains, and trail mix. If you're craving sugar, try snacking on a couple of dried figs. You'll get your fix with much more of a nutritional benefit than typical foods made with processed forms of sugar. Need to know: When water is removed, fruits become more concentrated in their fast-digesting natural sugars (and calories). As with all dried fruit, don't overeat shriveled figs. A great time to take advantage of their sugars is after a spirited workout, to help replace spent energy stores. Great things can come in small packages. Each tablespoon of sesame seeds will give you nearly 10 percent of the calcium you need every day! Include them in your diet more often than just eating them when they are sprinkled on hamburger buns. Other body-friendly perks include essential omega fatty acids, magnesium, copper, and manganese. You can toss the seeds into bowls of cereal, yogurt, and salads. They're also great in homemade energy foods such as bars and balls. Made by grinding up sesame seeds into a paste, tahini is another way to infuse your diet with more calcium. Try whisking it into salad dressings, incorporating it in homemade hummus, or blending it into protein shakes. Need to know: When possible, look for darker-colored, unhulled sesame seeds, which may contain higher amounts of calcium than hulled seeds. Sometimes available in Middle Eastern markets, ground-up sesame seeds labeled "sesame butter" (darker in appearance than typical tahini) is more likely to have been made with extra-nutritious, unhulled sesame seeds. Reliable calcium differences between black and beige sesame seeds are not yet available. Ross, A. C., Taylor, C. L., Yaktine, A. L., & Del Valle, H. B. (Eds.). (2011). Dietary Reference Intakes for Calcium and Vitamin D. National Academies Press. Onakpoya, I. J., Perry, R., Zhang, J., & Ernst, E. (2011). Efficacy of calcium supplementation for management of overweight and obesity: systematic review of randomized clinical trials. Nutrition Reviews, 69(6), 335-343.